for the school, the commencement coordinator, and the graduates. We do this by offering incredible service, utilizing highly-trained technicians, and partnering with schools to make their commencement ceremonies run as smoothly as possible. Our incredible service does not end with the ceremony, we also provide a user-friendly ordering process that best fits the needs of graduates, their families, and the school. As part of our commencement program, Lifetouch sets up an Affinity website for each of our schools. All events photographed for the school will appear on the site, so the school may provide a link to their graduates and families directly from the school website. How does this actually make things easier? The Affinity website is an “evergreen” website, which means that the school will never need to update the link to its own Affinity page. The link provided will always be the correct link for past, present, and future graduates to use in their search for images from the graduations we photograph for that school. In addition, each school and its Affinity page are co-branded, with the institution’s header at the very top. This way, each and every graduate visiting the page knows that they are at the correct place to view images for their school and for their graduation. Following the ceremony, we contact the graduates via email and mail. The email contains a hyperlink taking the user directly to the event in which their proofs are located, within the institution’s Affinity page. 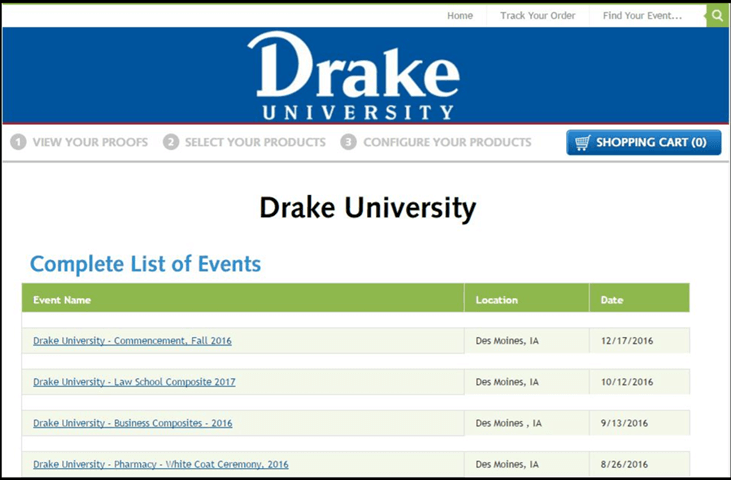 From there, users select the respective name from a list, enabling graduates and their parents to locate their images without having to search through a list of that school’s events. 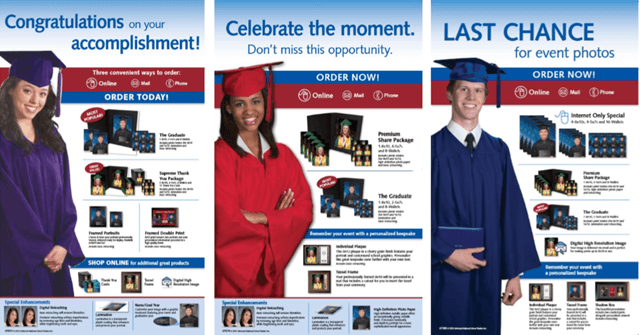 Additionally, each graduate is sent a traditional paper proof sheet. Each sheet displays a detailed list of package options and pricing plans, as well as information regarding online, mail, and phone ordering. All of these integrated touch points are personalized for the graduate and occur one-by-one following the event. 1. Open Event, Searchable: The most popular option among our clients. Visitors to the site can link to the event from the homepage and view all of the images. This is the easiest way for the graduate to find his or her images, which is why approximately 99% of our clients choose this option. 2. Open Event, No Names: The user can see all of the images from the event, but must scroll through to locate the images of their desired subject. 3. Event-Based Password: All participants are provided a common password to view images from the event. The password may be distributed via email, proof form, or at the event itself. 4. Subject-Specific Password: Each participant is given a unique pass code in order to view only their images. Passwords are communicated via email and/or proof forms.